3)Treat this GiftCard as Cash; it Cannot be replaced if lost, Stolen or expired. 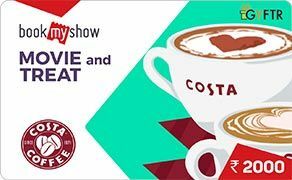 4)This Costa Coffee Giftcard is issued by Devyani international Limited for making payments at Costa Coffee Restaurants in India. 5)This card can be used multiple times for available balance(value/e-coupon/offer etc.) within the expiry period, any unused balance (value/e-coupon/offer etc.) cannot be used again or exchanged for cash. 6)No cash refunds will be given against this card for any event whatsoever (including in case of loss or otherwise). 7)This card is reloadable and any balance (value/e-coupon/offer etc.) in this card is valid for 6 months from the date of issue and any unused Balance will expire automatically. 8)Rights to amend terms & conditions are reserved with Devyani International Limited without prior notice. 9)For Card balance & expiry details. Please visit www.dil-rjcorp.com. 10)The user unconditionally accepts all T&C and shall not raise any disputes in this regard. 12)For Card balance and expiry check sms16 digit card number to 57575577.